Abstract: The Mallur Gutta (Hill) of Warangal district in Telangana state, India, reputed as a habitat for medicinal plants, was inventoried from 2009 to 2015 for its plant wealth through the traditional knowledge of the local people. 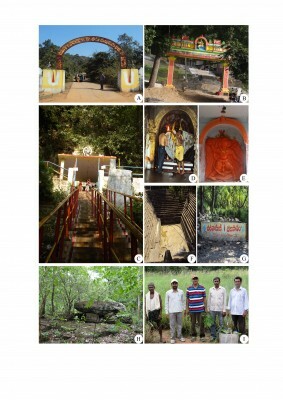 The Hindu temples of Lord Sri Laxminarasimha Swamy and Lord Hanuman, and the ethnic worship of mahua trees indicated it was a sacred grove which was selected as a Medicinal Plants Conservation Area. The exploration of Mallur Gutta resulted in the enumeration and documentation of plant wealth representing 470 species of 318 genera pertaining to 95 families of vascular plants. The importance of the grove as the residence for many rare or medicinal species in the state of Telangana is documented. The plant diversity is analyzed in terms of growth and life forms which indicate the prevailing microclimate, ecological opportunities and the species richness. The ecological services rendered by the Mallur Gutta forest ecosystem are documented to study how the great majority of the species are used by the ethnic and nonethnic people, and also the pilgrims who visit the shrine for its serenity. The study also identified two major threats to the conservation of hill ecosystem and the archeological site: 1) biotic pressure (the ever-increasing pilgrims, grazing by cattle, goat and sheep, the development activities taken up for the pilgrims, nondegradable litter thrown, collection of medicinal plants and widening of the pathway to the Chintamani perennial stream – the trampling and alien plant invasions of the marsh sustaining the stream); and 2) the potential for fire spreading from burning the litter. The study suggests the need to initiate remedial measures toward ecosystem recovery through fencing the natural vegetation, maintaining a fire line, and restricting the movement of people and domesticated animals on the hill top.